Reade Signs specialises in delivering signage and wayfinding solutions, using innovative materials and design that boosts brands. Our consultative approach means we support clients right from the start – from initial budget, concept and design, through to production, installation and maintenance. Reade Signs was established in 1980 and we’re trusted by leading UK organisations to get the job finished, safely and to a high standard. Clients include Audley, Berkeley Homes, Dartford Borough Council, Frimley Health (NHS), Grainger, Here East, L&Q, Linden Homes, Salford City Council, Socrates Communications and St George. 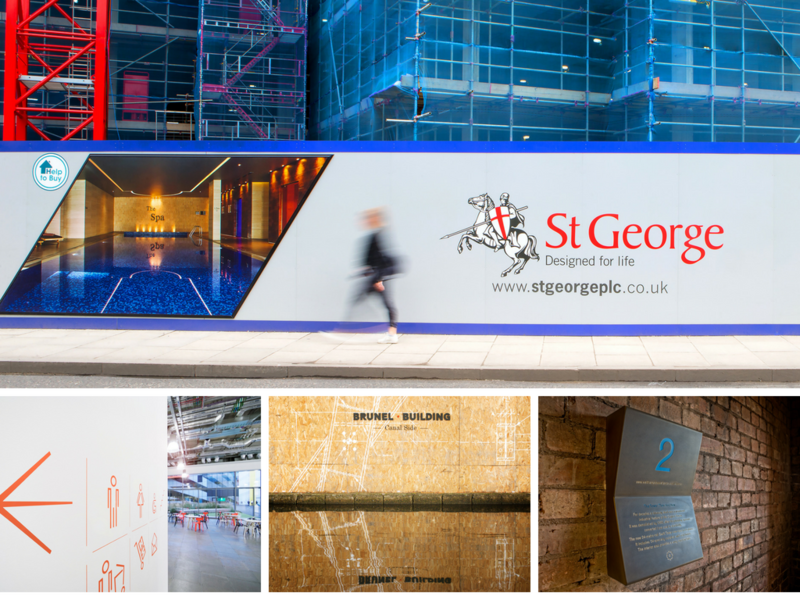 We work collaboratively with property developers, construction companies, architects, creative agencies, wayfinding consultants and corporate clients to ensure that every project is completed with commitment, attention and understanding. Every year our property specialists manufacture and install miles of stunning hoarding graphics, building wraps, illuminated sign boxes, site signage, flagpoles, flags, banners and marketing suites to promote new housing developments. Our architectural project team develops striking architectural and wayfinding signage using the highest quality materials and a mix of state-of-the-art and traditional processes to produce distinctive, informative and beautiful signs. We also create event signage, branding signage, retail signage and vehicle graphics. A montage of Reade Signs signage for St George (Berkeley), Here East, Brunel Building and Walthamstowe Wetlands.